Very good condition. One DVD is missing its case but is in a paper DVD sleeve. Teacher Guide/Curriculum presents a thorough, enjoyable approach to teaching Kindergarten. The curriculum will help train the student ot listen carefully, obey willingly, and develope good havits of thinking, ananlyzing, and appling important concepts and facts. Horizons 2nd Grade Math Don’t struggle any longer with teaching math concepts! With Horizons 2nd Grade Math from Alpha Omega Publications, math concepts are introduced, reviewed, and reinforced for complete mastery. Two full-color workbooks include easy-to-grasp math lessons on the Fahrenheit thermometer scale, English measurements, ratios, numbers, addition, subtraction, place value, shapes and so much more. This is a favorite math curriculum for many homeschooling families. Also included is your teacher’s guide that clearly outlines lessons 1-160. Comprehensive objectives, needed materials, and suggested learning activities in this curriculum reduce teaching preparation time. Plus, you’ll also find the daily homeschool lesson planner which provides detailed instructions, a student readiness evaluation test, duplication masters, answer keys, teaching tips, and additional worksheets, helpful resources to assist you in providing your child a thorough education in mathematics. In short, teaching math to your homeschooler doesn’t have to be difficult. Horizons 2nd Grade Phonics and Reading Strengthen your student’s reading skills with Horizons 2nd grade Phonics and Reading. Building on concepts learned in Horizons Kindergarten and 1st Grade Phonics & Reading, this comprehensive reading course increases your child’s reading and writing abilities. Using memorization techniques, fun-filled activities, and practical writing assignments, your child will reinforce his knowledge of consonant and vowel blends, silent letters, syllabication and accents, alphabetizing, possessives, comparative endings, and more! Plus, two brightly illustrated readers polish your 2nd graders reading skills with stories and poems using words that complement the phonics and spelling rules taught in each day’s lesson. This engaging, homeschool phonics and reading program also contains a must-have teacher’s guide that includes a daily lesson planner, teaching tips, duplication masters, answer keys, review worksheets, and 16 tests to evaluate your child’s performance. Specific goals, supplies, and activities are clearly outlined in the daily lesson plans to make teaching your child to read easy and fun. Sound fantastic? It is. Sharpen the tool your child needs most during his academic education. Order Horizons 2nd Grade Phonics & Reading today and help your child read his way to success! Horizons 2nd Grade Spelling & Vocabulary Teach your child to be an excellent speller with Horizons 2nd Grade Spelling & Vocabulary from Alpha Omega Publications. Whether sending a thank-you note to Grandma or completing a homeschool writing assignment, your child will look his best as he writes sentences with a solid understanding of phonics spelling rules and their application. Eye-catching lessons and hands-on learning activities in the student workbook are sure to have your child spelling and writing like an expert as he practices frequently-used words, sight words, and other word lists using crossword puzzles, word searches, and creative writing projects. Plus the easy-to-use spelling dictionary will familiarize your second grader with alphabetizing and the meaning of spelling words as he sees them used within the context of a sentence. Horizons 2nd Grade Spelling and Vocabulary includes a helpful, step-by-step teacher’s guide with specific goals, practical teaching tips, and suggested learning activities clearly outlined in daily lessons plans. And you’ll love the time-saving answer keys and reproducible teaching aids that include practice review worksheets and phonics rules flashcards. Make spelling a priority in your homeschooling day. Horizons 2nd Grade Penmanship Set Bring out the beauty of your child’s handwriting with Horizons 2nd Grade Penmanship from Alpha Omega Publications. This effective, Bible-based penmanship curriculum reinforces the basics of manuscript writing in lessons 1-75 and then introduces new cursive writing skills beginning in lesson 76 and continuing through lesson 160. Practice writing lessons include inspirational quotes, poems, and Scripture verses (NIV) on ½” lines to perfect your child’s handwriting. Friendly, colorful cartoon characters keep each lesson engaging, plus your child will love displaying his best writing on the beautifully bordered practice pages. Horizons 2nd Grade Penmanship also includes a complete teacher’s guide with reproducible practice pages and daily lesson plans. Practical teaching tips, activities, and illustrations make the most of your homeschool teaching time so your child can be writing cursive notes to family and friends in no time at all! Horizons 2nd Grade Health Lay a firm foundation for healthy living in your second grader and get the colorful, print-based Horizons 2nd Grade Health. Complete and easy to teach, Horizons 2nd Grade Health comes with a soft-cover teacher’s guide and a consumable student workbook that explain practical, age-appropriate health topics to your homeschooler. Fun and Bible-based, this health course covers topics like the ups and downs of family life, ways to stay fit and active, personal grooming, and medicine and drug uses. The step-by-step teacher’s guide includes 54 lessons, along with suggested puppet dialogues and a list of needed materials, objectives, lesson overviews, related activities, and more! Recommended to be taught two to three days per week, Horizons 2nd Grade Health also comes with a student workbook that has over 40 colorful student visuals and activities. Perforated for easy removal, these fun resources complement topics taught in the teacher’s guide. Adaptable to any schedule, this flexible, Christian-based curriculum can be integrated easily into other Horizons 2nd Grade curriculum. 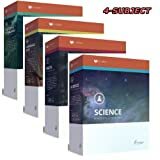 This Horizons five subject curriculum set contains everything you need to launch your students 2nd grade year: Curriculum for Math, Phonics & Reading, Health, Spelling & Vocabulary, and Penmanship. Horizons 3nd Grade Math Looking for creative ways to make multiplication, division, and other complex math concepts more exciting? Award-winning Horizons 3rd Grade Math from Alpha Omega Publications contains fun-filled, teacher-directed activities perfect for interactive learning. Play money, flashcards, games, and other suggested manipulatives in this Alpha Omega curriculum reinforce your child’s retention as new concepts are introduced and reviewed. Throughout this colorful, brightly illustrated course, mind-stretching lessons will have your child mastering more difficult mathematical concepts like equations, rounding, graphing, the metric system, map reading, and decimal equivalents, in no time at all! This best-selling homeschooling math curriculum also includes a two-part, comprehensive teacher’s guide that clearly outlines 160 lessons. Specific objectives, needed materials, and suggested learning activities in this Alpha Omega curriculum save on precious teaching preparation time. Plus, you’ll love the daily homeschool lesson planner, student readiness evaluation, answer keys, teaching tips, and additional worksheets that keep you focused as you give your 3rd grader a thorough education in mathematics. Sound great? It is! Teaching math to your homeschooler has never been easier or more fun! Horizons 3rd Grade Phonics and Reading Building on phonics and spelling rules, Horizons 3rd Grade Phonics & Reading increases your child’s reading and writing abilities with memorization techniques, fun-filled workbook activities, and practical writing assignments. This in-depth course reinforces knowledge of consonant and vowel blends, silent letters, and syllabication, while introducing new concepts like regular and irregular comparisons, compound words, inflected endings, and foreign words. In addition to two student workbooks containing 160 engaging lessons and activities to help your child master phonetic and spelling rules, and enhance vocabulary; two brightly illustrated readers reinforce your child’s reading skills with enriching stories and poems that complement daily lessons. This Christian homeschool program also contains a user-friendly teacher’s guide that includes a daily lesson overview, teaching tips, answer keys, and 16 tests to evaluate your child’s performance. Plus, daily lesson plans clearly outline specific goals, supplies, and activities to make learning to read easy and fun. Horizons 3rd Grade Spelling & Vocabulary Sharpen your child’s spelling skills with Horizons 3rd Grade Spelling & Vocabulary from Alpha Omega Publications! Brightly illustrated lessons and hands-on learning activities focus on phonics rules for short and long vowels, plurals, diphthongs, and more. This comprehensive homeschool course studies frequently-used words, sight words, and other word lists with crossword puzzles, word searches, and creative writing projects. Plus, a handy spelling dictionary reinforces alphabetizing and vocabulary skills by using each spelling word within the context of a sentence. Horizons 3rd Grade Spelling and Vocabulary also includes a helpful, step-by-step teacher’s guide that clearly defines daily lesson plans with specific goals, practical teacher tips, and suggested learning activities to make spelling easy and fun. In addition, answer keys, reproducible worksheets, and flashcards are included to save you hours of time. Horizons 3rd Grade Penmanship Set Good handwriting is needed in every area of life. Make sure your child’s handwriting is something to be admired with Horizons 3rd Grade Penmanship from Alpha Omega Publications. This Bible-based penmanship curriculum uses a unique approach to reinforce manuscript and Zaner-Bloser® cursive writing. Each week your child will practice writing words, sentences, and quotes about Noah, Joseph, The Tower of Babel, or Abraham and Isaac on 3/8″ lines in a colorful student workbook. A weekly vocabulary word list is also taken from Scripture passages. In addition, a specially designed practice page allows your child to share his beautiful scripted writing of God’s Word with homeschooling friends and family. Horizons 3rd Grade Penmanship also contains a complete teacher’s guide with reproducible practice pages and daily lesson plans that include practical teaching tips, activities, and illustrations. Your child’s handwriting will turn into a work of art! Horizons 3rd Grade Health Explain body systems to your third grader with the affordable, print-based Horizons 3rd Grade Health. Containing everything you need for the year, this program comes with a soft-cover teacher’s guide, student book, and a consumable student workbook that explain practical, age-appropriate health topics to your homeschooler. Including a Christian viewpoint, this health course covers topics like first aid, proper eating habits and food choices, manners, etiquette, and more. The step-by-step teacher’s guide includes 55 lessons, along with suggested puppet dialogues, a list of needed materials, objectives, lesson overviews, and related activities! The Horizons 3rd Grade Health full-color student book includes student readings, photos, illustrations, and questions to reinforce the lessons. The student workbook has over 30 perforated, colorful student visuals and fun activities that complement topics taught in the teacher’s guide. Flexible for any homeschooler’s schedule, this health curriculum is designed to be taught two to three days per week.